When you want juicy and delicious grilled food for your meals, you want to consider the Char-Broil Performance TRU-Infrared 500 3-Burner Gas Grill option for your backyard setup. 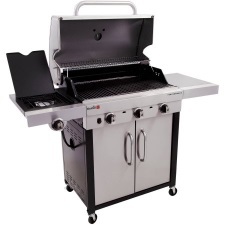 This amazing grill offers great temperature control, ample grilling space for multiple servings at a time, and a sleek look that is appealing and goes with any backyard setup you may have. Your family will love dinner time every night this summer as you fire up this convenient grill to cook amazing and healthy food for your loved ones. Whether you’re cooking for two or for 20, this grill has got you covered. With the superior stainless still lid and temperature gauge, you can control your cooking temperature with greater efficiency than ever before. This allows you to properly cook your meats and vegetables to the right doneness every time you crank up this gas grill. You’re going to love the juicy meat you’ll be able to prepare without worrying if you’re going to burn it or get it too done that it’s hard to consume. This type of grill offers the infrared burners which also offers a greater efficiency of cooking your food to the proper temperatures. With greater control over the cooking temperature, you’re sure to love the way this grill will prepare all your meals each time you cook outdoors. When it comes to grilling in your backyard during the summer, you want to be able to invite over friends and family and not worry about your grilling being too small to cook. With the Char-Broil Performance model that is not a concern, you have to consider. The grilling space offers 500-square-inches of grill coverage to allow you to cook multiple servings all at one time. There is also a side burner offering 10,000 BTU’s to help you get that extra special sear mark or cook other items you didn’t quite have room for on the grilling surface. The infrared technology also means your entire grilling surface heats up faster and more efficient than gas or charcoal versions. You can enjoy the quick grilling time and have your family sitting down to dinner in no time. There are a lot of mixed reviews on this specific Char-Broil Infrared model. Most people who have purchased the grill do enjoy using the item, giving it a 3.8 out of 5-star rating on Amazon. Over 126 people have offered their reviews so it’s easy to see what things work with this unit and what items you may want to know about before purchasing. Some of the reviews stated that the grills were missing pieces when they opened the boxes to assemble. However, Char-Broil did send the replacement parts and the grills were able to be assembled and used as described. Some also stated that their item was damaged during shipping so that’s another item to look for when you receive your Char-Broil Performance TRU-Infrared Grill. Reviewers shared their comments stating … “Great grill and amazing customer service!” … “Nice grill and definitely worth the price” … “Better than plain gas grill” … “This is quality” … “Very Satisfied”. If you’re looking for an efficient cooking grill that offers easy heat-up and even cooking, then the Char-Broil Performance TRU-Infrared 500 is the one for you. It offers a sleek design hiding any bulky propane tanks you have to run the grill. It can provide an even cooking temperature so that all your food comes out juicy and delicious, every time. This is a great addition to any backyard kitchen setup you wish to construct and is an eye-pleasing addition to your outdoor cooking. With ample grilling space and even cooking temps, you’re sure to love this new addition to your home.